Last week arki_lab team was busy carrying out urban design workshops for 8th graders at Brønshøj Skole in Copenhagen. These workshops apply specific aspects of the school reform system in Denmark in terms of enabling teaching and learning in new environments while developing perspectives outside the school context. The methodology we use in these workshops aims to foster greater awareness about the city and various features of urban environment. 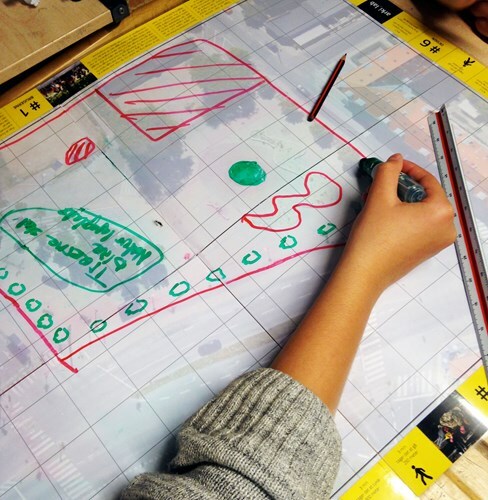 More specifically, our “Local Square” workshop educates young students about urban design and planning by taking a role of urban planner in their local environment. Therefore, their task was to propose a redesign plan for the local square – Brønshøj Torv, by applying interactive educational tools produced by arki_lab. Firstly, we created arki_nopoly – a board game that serves as a playful learning platform about design process and a method of conducting a spatial analysis while taking into consideration usage of the site and multiple sets of users. In our experience at Brønshøj Skole, Arki_nopoly has proved to an innovative educational tool that enables learning in a fun and stimulating way. Furthermore, during the design phase of the workshop, the students used our CoCityApp –a digital tool which provides contextual understanding of the site and enables immediate design intervention by the user though a collage technique. While using CoCityApp on-site, students qualified their initial ideas from the board game and produced collages which visually capture various segments of their design proposals. Crowdsourcing was done as the final phase of the workshop, in which students presented their design proposals and were engaged in a discussion. Crowdsourcing was facilitated by arki_lab team in order to foster students’ ideas and encourage critical thinking and debating skills. Interestingly, students showed a great interest and engagement during final discussions especially amongst themselves, which proves the positive effects of an interactive learning environment.